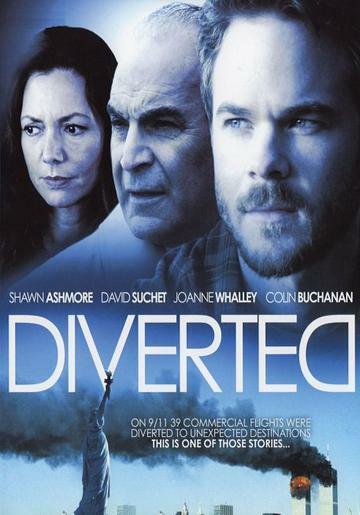 Starring�David Suchet & Joanne Whalley.�When terrorists attack New York's World Trade Centre, flights bound for North America are�ordered to make emergency landings. Many of the planes are diverted to the small town of�Gander, in Newfoundland. David Suchet & Joanne Whalley. ordered to make emergency landings. Many of the planes are diverted to the small town of Gander, in Newfoundland. As the tragedy in New York unfolds, the town of Gander struggles to shelter some 6,000 unexpected guests. Paths cross and lives intermingle as the passengers and townspeople get to know one another. We see the very best in mankind despite the disaster, but Gander is forever changed. Diverted is a multi-faceted film about finding hope in tragedy and goodness where you least expect”. SHAWN ASHMORE (X-Men, Terry) and COLIN BUCHANAN (Dalziel and Pascoe, The Secret).